Dropped by last night at Galileo to see Cami's performance. My long time friend Fielding (Peep) Piepereit was in town and we both had a blast listening to the band and enjoying the ambiance of the place. The light was low, the beer was cold and the band was HOT! 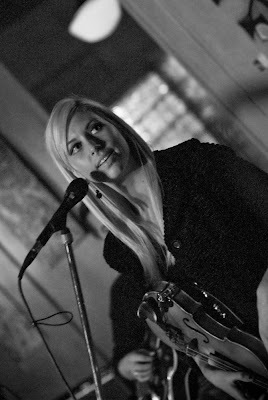 I plan to post a few shots soon for the band, but here is a cool B/W of Cami singing my favorite song from my website. I can't wait for the CD!